Squeezed by high rents and wages that, though rising, have hardly kept up with inflation, American workers have continued to migrate away from expensive coastal hubs (think New York City and San Francisco) in favor of Sun Belt cities where relatively cheap rents, nicer weather and good job opportunities await. 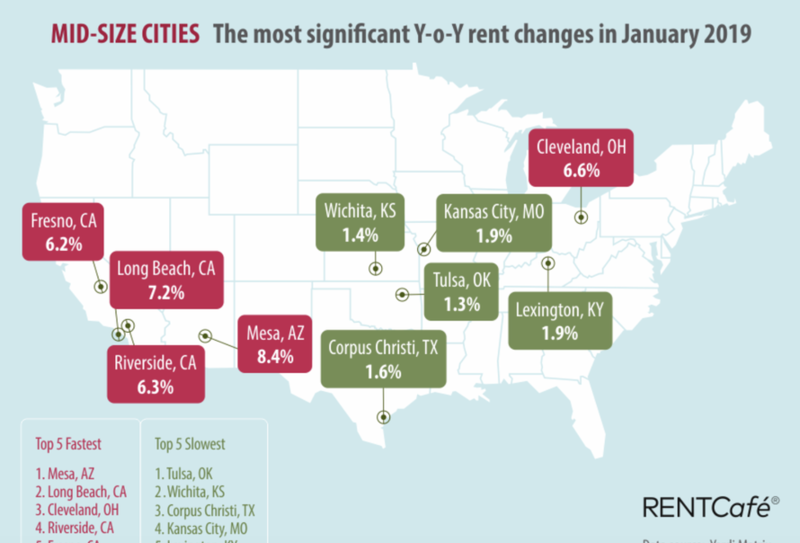 But as moving to the Sun Belt grows in popularity, the influx of newcomers is beginning to impact the cost of living, as RentCafe's latest monthly rent report revealed. While the national average rent climbed only slightly in January, marking a yoy increase of just 3.3.% according to RC's Yardi Matrix of national rent prices, rents rose most rapidly along the Sun Belt, with the steepest increases seen in smaller cities like Las Vegas suburb Henderson, Nev.
Analysts believe this is largely a factor of high prices along the coasts inspiring more Americans to look to build their lives elsewhere. Doug Ressler of Yardi Matrix: Despite affordability remaining an issue going forward, demographic trends will continue to support housing demand. The attractiveness of large coastal knowledge-intensive metro areas will persist, but high prices will drive some residents to smaller metro areas away from the coasts. Demand for apartments in attractive areas will remain strong, driven by the strength of the local economies. Of large metro areas in the region, Las Vegas stood out as the city where rents saw the fastest growth (+8.3%) with rents in Phoenix, Arizona, also seeing a large (+7.6%) increase. 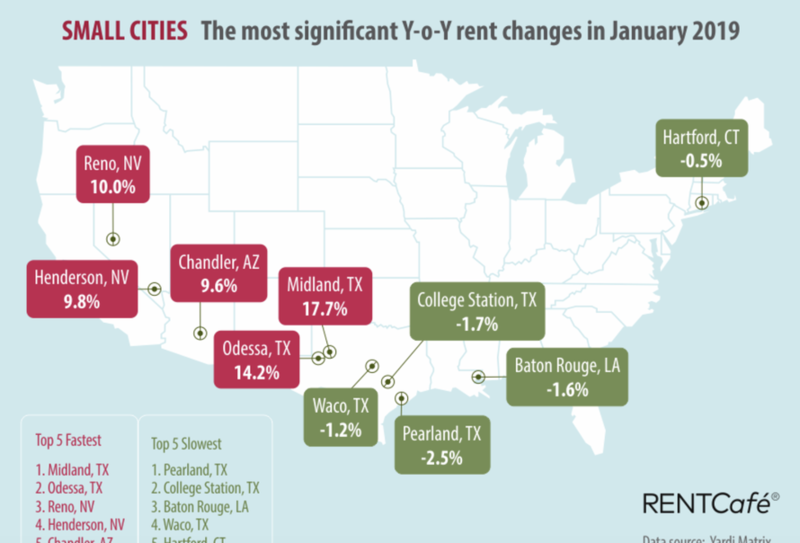 Since last January, the hottest rental markets out of the 20 largest renter hubs in the U.S. were all located in the Sun Belt. Las Vegas apartments have seen the fastest rent growth in the top 20, having registered an 8.3% year-over-year increase over the past 12-month period. 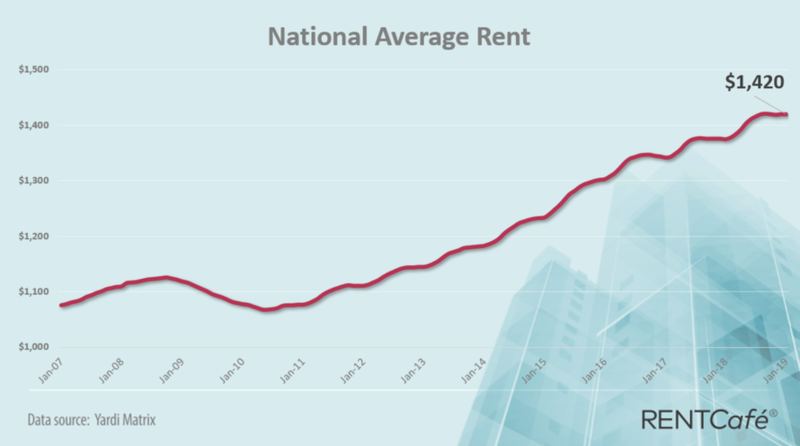 Sin City’s average rent rose to $1,048, up from $968 last January. 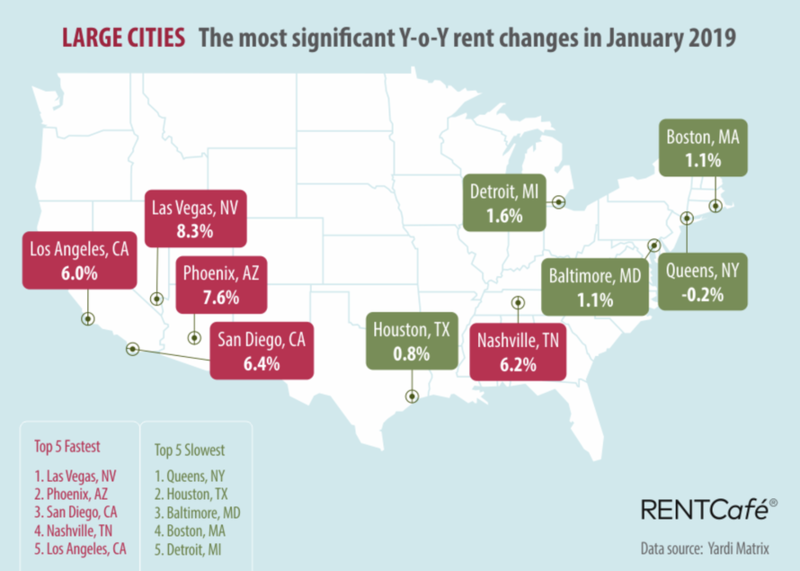 Phoenix’s average rent also saw a sharp increase of 7.6% y-o-y getting to $1,018, leaving the Arizona city in second place among the largest rental hubs in the country. Rent growth was also brisk in Los Angeles(6%), Jacksonville (5.9%), Atlanta (5.6%) and Austin (5.6%). In fact, the only large city in the US that saw rents decline you was - ironically enough - the NYC borough of Queens. Rent prices in Houston, Boston and Baltimore also saw slower-than-usual growth. Among mid-sized cities, rents in Cleveland (6.6%), Mesa, Arizona (8.4%) and the California cities of Long Beach (7.2%), Riverside (6.3%) and Fresno (6.2%) saw the strongest increases. However, the fastest yoy increases occurred in smaller cities like Midland, Texas (17.7%), Odessa (14.2%) and Reno (10%). 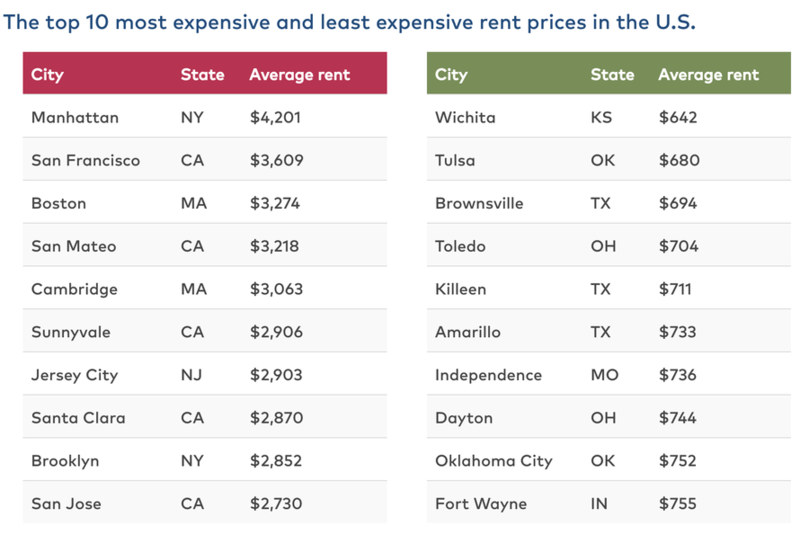 And finally, RentCafe presents the 10 most expensive - and least expensive - markets to rent a home.